Is your telly too small - or too big - for HD? Is Full HD really necessary? As well as asking BBC staff how far they sat from their TV sets, the researchers ran a second set of tests to determine how much detail the human eye can resolve. This was done with a series of test images, and methodology that’s described in some detail in the whitepaper. Essentially, it involved comparisons between series of filtered and unfiltered images, and the result was broadly in line with the accepted figure of one minute of arc - 1.054, to be precise. For the vast majority of viewers, a resolution of 1280 x 720 - 720p - will be sufficient for screen sizes of up to 50 inches diagonal, while 1440 x 1080 may suffice 50-56in screens – a figure that may perhaps influence the decision to broadcast some BBC HD services with a horizontal resolution of 1440 rather than 1920 pixels, though it's also to do with maintaining a 4:3 aspect ratio - which contains an anamorphic picture that stretched to the correct dimensions by a widescreen telly. And if you’re one of those who feels that you’re being short-changed by the picture quality on some channels, or perhaps someone who simply can’t see what all the fuss is about, a second set of results shows the proportion of people in the test who required a specific standard. 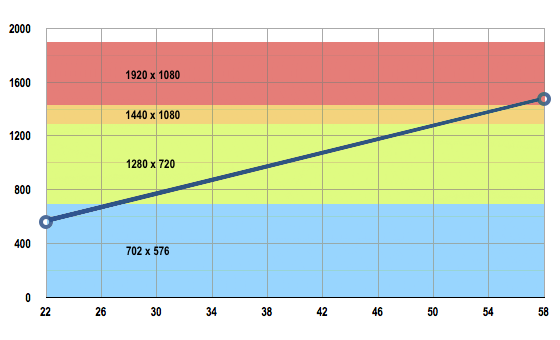 At sizes of 35-40in, it seems that up to around 15 per cent per cent of people will notice a higher quality than 720p, though the proportion noticing anything better than 1440 x 1080 doesn’t increase beyond 15 per cent until screen sizes exceed 45in.